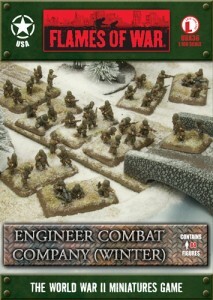 Battlefront has some new US Combat Engineers wearing Greatcoats for Flames of War. Maybe if you look at them and think cold thoughts, this summer heat will go away for a bit, eh? Engineer Combat Company (UBX36) contains one Company Command Carbine team, 2iC Command Carbine team, two Platoon Command Pioneer Rifle teams, two Engineer Combat Platoons with two Operating Squads & one Weapons Squads, four optional Operating Squads, three Booby Trap tokens, four Small three-hole bases, four Medium four-hole bases & twelve Medium five-hole bases.